WARNING: Basalt columns are very heavy. Be careful when lifting, carrying, moving or placing stone columns to avoid dropping. More than one person is recommended to install these stones. NOTE: Basin may vary from illustration. Use these steps as a general guide for assembly. 1. Determine location of basin in landscape and excavate hole. Ensure that the base of the hole is level in all directions. Place basin in hole. Ensure that proper support is in the basin to handle weight of the columns. 2. Put pump in basin and run cord through hole in basin top. 3. Insert tubing into friction ring. If kit includes LED light ring, connect the LED light ring to tubing. 4. Run other end of tubing and LED light ring cord down through the hole in the basalt from the top. Press the friction ring and the LED light ring in the hole. Run the tubing through the basin top to the inside of the basin and connect with pump. Run the LED light ring cord out of the basin with the pump cord. 5. Carefully place basalt column onto basin. If tubing was not able to be connected to pump or manifold in previous step, connect the tubing once the basalt columns are in place. 6. Cover the basin with decorative stone and fill basin with water. Leave access to pump for final flow adjustments to be made. 7. Connect the LED light ring with the transformer and plug in the pump. Make final flow adjustments and finishing covering with decorative stone. 1. 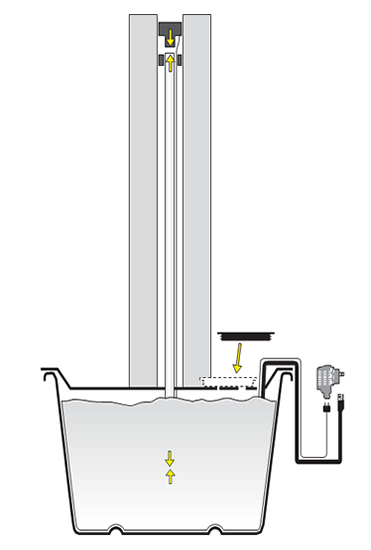 Maintain water level to keep pump fully submersed. Add water as needed. 2. Algaecide or bacteria may be added to help keep water clear. Do not use chlorine as this may have negative effects on the pump. 3. In freezing climates the feature should be shut down and winterized. Remove the pump from the feature and store in a dry warm place until freezing conditions are over.